Have your timepiece, and wear it, too . 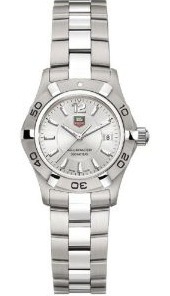 . . with the TAG Heuer Women’s Aquaracer Stainless Steel Watch WAF1412.BA0823. If you’re looking for watch that lets you bask in practical glamour, this Aquaracer watch for women warrants a second look. A round, silver dial with luminescent strips atop polished steel hands decorate the face of this TAG Heuer timepiece. The rotating bezel, offset by a circular ring of polished steel against six silvery accents, measures any time limits you impose in well-marked 10-minute increments. Rotating only one direction, the bezel leaves little room for error. Contrasting the roundness of the dial and the crisscross pattern of the bracelet links, the bezel’s slightly angled edges pull the eye over the thin band of polished steel running the length of the bracelet. The sheen of the hands, hour markers, and crown against muted steel give a clean, two toned look to this watch. A member of the Aquaracer collection, this watch merges style with sensibility. The tested water resistance and moving bezel give this piece sporty and functional features, but with a fine-brushed elegance. From work to home, you’ll be able to depend on the quality seals of the TAG Heuer brand (at 12 o’clock) and the “Swiss Made” label (at 6 o’clock). While this watch perfectly versatile, if you’re looking for a timepiece that doubles more clearly as a piece of jewelry, you might consider the Carrera line’s more delicate design, free of the turning bezel. If you’re only looking for just a little flash but want to retain the sports watch elements, come back to the Aquaracer collection and consider whether a grey or pink mother of pearl dial would meet your fashion bar. An Aquaracer with diamond hour markers adds some sparkle, but starts nearer to $2,500. Add a diamond-encrusted bezel, and move into the $4,000 range. If you simply want uncomplicated elegance and functionality in one timepiece, however, the TAG Heuer Women’s Aquaracer Watch WAF1412.BA0823, at $1,700, belongs on your wrist. For a sports watch that communicates class backed by unrelenting quality, consider the TAG Heuer Women’s Aquaracer Watch Stainless Steel Watch WAF1412.BA0823. Online retailers list this watch much lower than retail, at $995, which means . . . if you’re not already swayed by form and function, you can add affordability to the list, too.